Vita Vibe Professional Series adjustable height floor mount ballet barre / stretch bar. 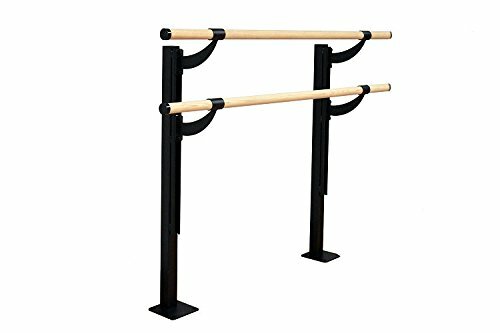 The FD72-W is a beautiful sanded smooth, finish ready hardwood Ash 6 foot wide adjustable height, floor mountable double bar ballet barre with black endcaps. The FD72-W includes 4 brackets (2 for each barre) which are fabricated from 1/4" thick steel and powdercoated in a texture black finish and 2 adjustable height FS1 Floor Stanchions. Mounting hardware (with the exception of floor anchors) is included. The barres can be stained or finished to your desired color; however; most studios prefer to let the wood naturally patina over time. If you have any questions about this product by Vita Vibe Floor Mount Ballet Barres, contact us by completing and submitting the form below. If you are looking for a specif part number, please include it with your message.